Sony's shift from SmartWatch to SmartBand fitness tracker will reach the public next month alongside an accompanying mobile application, the company confirmed at MWC 2014. The Sony SmartBand SWR10, announced last month at CES, is the first gadget to be powered by Sony's new Core fitness tracking technology. The launch in 60 countries will also see bring the Lifelog app for Android, which promises to track not just your exercise routines, but also the places users visit, the songs they listen to, and books they read. 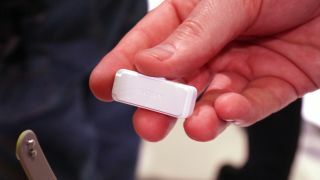 The Lifelog app, which connects to the SmartBand via NFC or Bluetooth, will present the info in a neat interface and will also help out with recommendations for future entertainment content. Going back to the SmartBand, which is yet to be priced, it is designed to be worn 24/7 and is fully waterproof - a la the company's most recent Xperia smartphones. The independent, removable Core module means it can also be detached and carried in a pocket rather than worn. Can Sony's entry into the burgeoning fitness tracker world match high profile entries from the likes of Jawbone, Nike, Adidas, Fitbit, Fitbug and more? Let us know your thoughts in the comments section below.